The Texas Windstorm Insurance Association (TWIA), the largely coastal residual market property insurer in the state, is to return to the catastrophe bond and reinsurance market to secure a new program for 2018, which could result in more capacity being purchased after some of its financial protection has been eroded by hurricane Harvey. Hurricane Harvey completely depleted TWIA’s Catastrophe Reserve Trust Fund (CRTF), a type of buffer account held by the containing net gains from prior years that sat at the bottom of the insurers financial protection and reinsurance tower. Also eroded by Harvey was a portion of TWIA’s Class 1 public securities, which sat atop the CRTF. 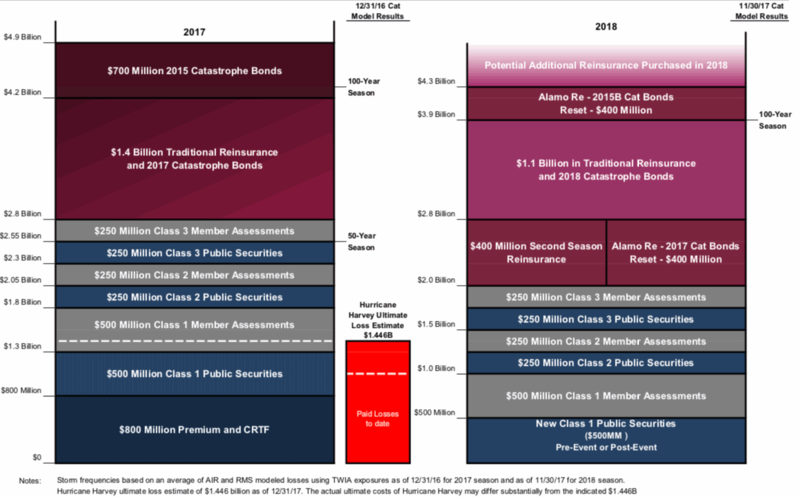 The result of this erosion of its financial protection is that TWIA’s reinsurance layers have dropped down somewhat for 2018, with reinsurance now attaching at $2 billion instead of $2.8 billion, which has only been possible thanks to the flexibility that its Alamo Re catastrophe bonds provide and also a second event reinsurance cover it purchased last year. TWIA is expected to reset its $400 million Alamo Re Ltd. (Series 2017-1) cat bond so that its attachment point drops to the new $2 billion bottom of its private reinsurance provisions, down from the $2.8 billion it attached at from issuance. The Alamo Re 2017 cat bond will now sit alongside a $400 million second season reinsurance coverage, that came into effect once the CRTF was eroded. TWIA purchased the second season cover with terms that it could only be activated by a loss event, or series of events, during the 2017 reinsurance contract term that caused it to draw-down on its surplus, held separately in the Catastrophe Reserve Trust Fund. Hurricane Harvey was that event and so the second season reinsurance coverage has come into effect and will fill a whole in TWIA’s reinsurance program for 2018/19, alongside the cat bonds which drop into place beside it. Sitting above the $800 million layer filled by the second season reinsurance and the Alamo Re 2017 cat bond is a layer attaching at $2.8 billion, which TWIA expects to fill with a combination of reinsurance and 2018 catastrophe bonds. TWIA’s latest estimate for losses from hurricane Harvey stands at $1.446 billion, an increase from its previous estimate of $1.132 billion, which has led to discussions over how best to fill its reinsurance needs for 2018. During a recent Board meeting Jerry Fadden, Chief Financial Officer of TWIA, explained the situation after the erosion of the CRTF by Harvey. He explained that the erosion of the CRTF and most of the public bonding beneath the reinsurance means that the attachment drops down for the coming year. The CRTF cannot be easily replenished, TWIA believes it could take some years before it has sufficient surplus to fill that gap in its tower again. Fadden discussed the flexibility that its 2017 reinsurance provided, saying, “The Board purchased a second season cover last year, so while our reinsurance attachment point for our reinsurance drops as a result of the CRTF going away, from $2.8 billion to $2 billion, the second season cover is available to provide $400 million of coverage attaching at the $2 billion level. “In addition one of the benefits of catastrophe bonds, as part of our reinsurance program, is that they are available on a multi-year basis and have a reset feature to them. “We are working with our reinsurance broker and their securities affiliate, GC Securities, to figure out where to reset those bonds, but it looks like they can also be reset to attach at the $2 billion level. “So the combination of the second season cover and one of the cat bond issues would total $800 million, bringing the attachment layer for our traditional reinsurance back up to what it was last year at $2.8 billion. Last year’s reinsurance and catastrophe bond program attached at $2.8 billion and covered TWIA for losses up to $4.9 billion, above the statutory minimum 1-in-100 year level that the insurer is mandated to buy protection to. TWIA also has a $400 million layer of catastrophe bond coverage remaining from its $700 million Alamo Re Ltd. (Series 2015-1) issuance, of which the $400 million Class B tranche provides coverage through to June 2019. Board meeting documents show the $400 million Class B tranche of the Alamo Re 2015-1 cat bond as being reset to attach at $3.9 billion and cover up to $4.3 billion, which therefore would leave a $1.1 billion gap to be filled by new purchases that TWIA is currently in the market trying to arrange for 2018. TWIA has been de-risking its portfolio gradually, through de-population and other means, leaving the organisation in a position where its risk transfer tower can be filled with a smaller reinsurance purchase in 2018, despite the erosion of the CRTF. But the end-result, after TWIA renews its reinsurance and purchases any cat bonds this year, is likely to be that the insurer will have more risk transfer from the private markets than it did last year. In 2017 TWIA had reinsurance and cat bonds covering from an attachment point of $2.8 billion up to $4.9 billion, so a $2.1 billion layer of its tower. This year, with the attachment point now being at $2 billion, TWIA may buy up to as high as $4.3 billion, providing more protection than the 1-in-100 year event requires, so meaning the private reinsurance and ILS market may account for $2.2 billion of its tower from the 2018 renewal. At a recent Board meeting, TWIA executives resolved and approved a motion to buy a combination of reinsurance and catastrophe bonds up to the $4.3 billion level with a budget of $110 million available that its broker felt should allow it to fill that $1.1 billion gap and perhaps also have some budget left for a fresh second event coverage. Second event protection has clearly proved its worth after hurricane Harvey, but so too have the multi-year nature of TWIA’s catastrophe bonds and it’s possible that this could motivate the TWIA execs to look to cat bonds to become an even larger percentage of the insurers reinsurance protection this year because of that. If a specific second season, or event, coverage is not available from the market then TWIA’s execs will look to buy additional reinsurance instead, so any cat bond issuance could prove an effective way for the insurer to secure more coverage, while also having tranched, multi-year reinsurance in place. We understand that TWIA has begun its visits to reinsurers and ILS investors, as it plans for its renewal in the second-quarter and that appetite for new catastrophe bond issuances from the insurer is expected to be high. It will be interesting to see what combination of reinsurance and cat bonds are bought, as well as how TWIA covers itself for another event like Harvey and plans for the next season’s protection as well. The illustration below shows TWIA’s 2017/18 funding structure on the left, the hurricane Harvey impact in the middle and a suggested tower for 2018/19 on the right.